More will be done with the advanced magician classes once OBT starts. The purpose of these lists are to help people look into what is involved in the Magician classes, to help them decide if it is a class they would like to choose, or to help people who are magicians already see what skills to look forward to.MagiciansMagicians are a very intellectual class. They are capable of buffing other players. A Magicians only weapon of choice is a staff. Magicians at level 40 can choose to become a Warlock or Priest. Staff Mastery: The character learns how to use staff weapons. Increase the physical attack and magic attack permanently when the character is equipped with staff weapons. Introspection: Increase the character’s mana limit permanently. 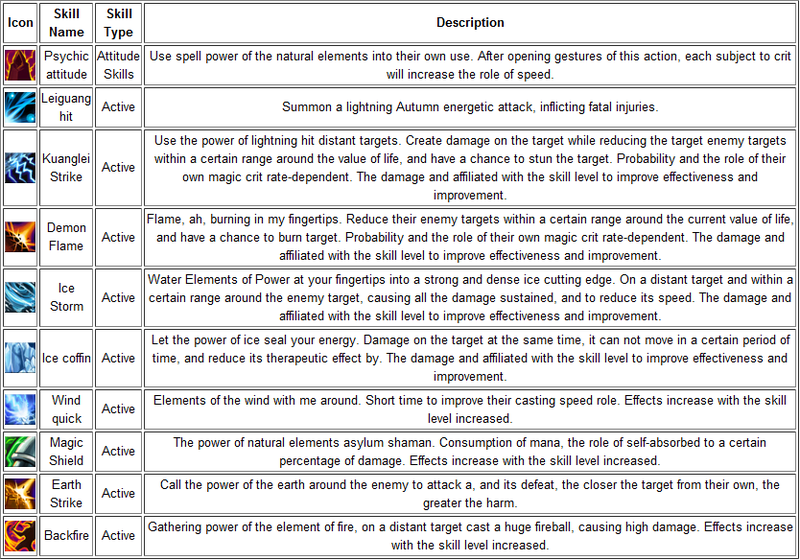 Caster Training: The mage can cast magic more quickly. Increase the character’s casting speed permanently. Magic Missile: Cause damage of no attribute to the remote target with the power of magic. The damage increases with the skill level. Arctic Blast: Use the power of ice to cause damage to the remote target and reduce his movement speed. The damage increases with the skill level. Fireball: Use the Flame Power to attack the remote target and cause a great deal of damage. The damage increases with skill level. Spiritual Blast: Be concentrated and cast instantly, causing damage of no attribute to the enemy nearby. It can’t be used for a short duration after being used for 5 times in a row. The damage increases with the skill level. Attack Boost: Enhance a comrade’s fighting capacity with the magic power so that his physical attack improves a set duration. 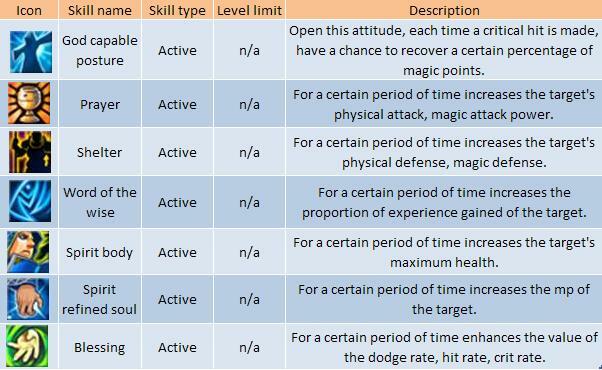 The physical attack improved increases with the skill level. Defense Boost: Enhance a comrade’s defense with the magic power so that his physical defense improves within a set duration. The physical defense improved increases with the skill level. Priests by aeonrivas and leyverhoePriests are a very important support class. They are strong in their healing and buffing abilities. They can equip a mace or staff. Priests can later become Bishops or Prophets. 1H Mace Mastery: Increase the physical attack and magic attack when the character is equipped with 1H mace weapons (hammers, maces). Holy Light: Shoots a beam of light magic to cause continuous damage over time. Power increases with level. Angelic Ring: Causes damage to all enemies surrounding the character. Damage increases with skill level. Blessed Recovery: Heals target and continues healing target for 5 seconds. 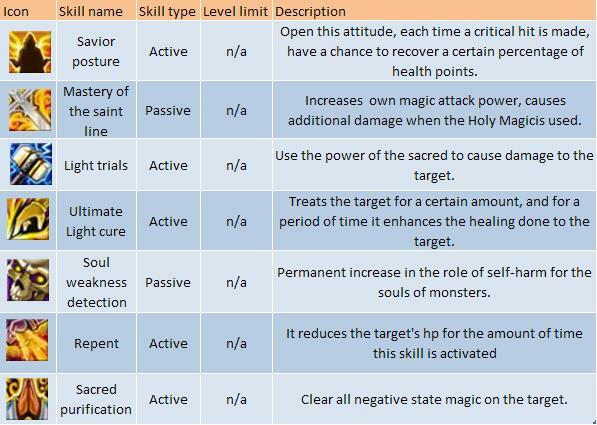 Healing power increases with skill level. Heal: Heals the target for 3 seconds. Healing power increases with skill level. Healing time increases with skill level. Healing Stance: Each time the caster casts a spell, his magic power goes up by 3 each stack. Stacks up to 10 times. Divine Enchantment: Enhances a team member’s physical damage for a set duration. Attack increases with level. Divine Protection: Enhances a team member’s physical defense for a set duration. Defense increases with level. Necromancer, Uses Drain, DoT and CC skills. Wizard/Elemantalist, Uses AOE and DD skills.